Economy - Reduces kW/ton with advanced component design. Eco2 models, using HFC-407C, have highest COP in the industry. Ecology - Environmentally responsive Eco2 models use HFC-407C, which has zero Ozone Depletion Potential and low Global Warming Potential. Control - 'Fuzzy Logic' provides tighter control; easy-to-use microprocessor control panel allows inputs/outputs in choice of English, Spanish, French, or German. ptiView Control Center - Ensures optimum performance and easy operation. Real-World Efficiency - Designed for maximum efficiency in the real world, where 99% of the cooling season is spent at off-design conditions. Application Versatility - In addition to air-conditioning duty, MaxE screw chillers easily adapt to brine cooling and thermal storage. Reduced Maintenance Costs - The rugged design of YORK screw compressors means no scheduled maintenance is required. Environmentally Responsible - As a standard, YORK water-cooled screw chillers offer environmentally responsible HCFC-22 refrigerant. Zero-ozone-depletion HFC-407C refrigerant is also available. 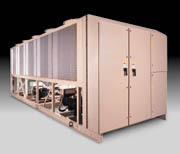 Reduced Energy Costs - YORK water-cooled screw chillers are industry leaders in efficiency. Flexible - Also available for connection with remote air-cooled condenser.